Line of articles useful both for pre-workout warm up and to maintain body temperature during the exercises during the winter. wrap-over top made by wool or warm cotton with a comfortable crossover to wear over body and academics during the colder months. Legwarmers in wool or warm cotton, both long and short, perfect to wear during training. 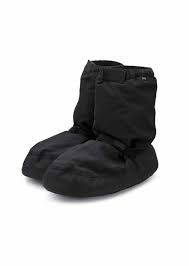 Comfortable warm up boots perfect to begin the dance lesson and softly warm-up the feet. All products are made in Italy using wool or warm cotton depending on the customer’s request.